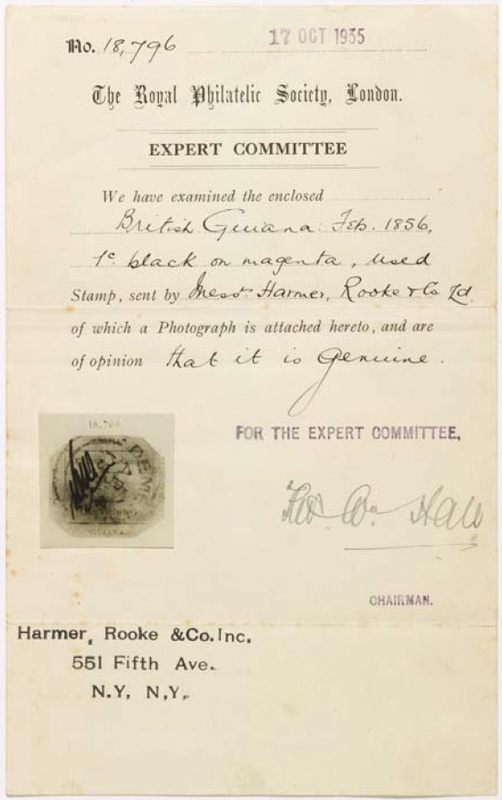 The rarest stamp in the world, the 1856 British Guiana One-Cent Magenta, is going up for auction in a dedicated evening sale at Sotheby’s New York office on June 17th. 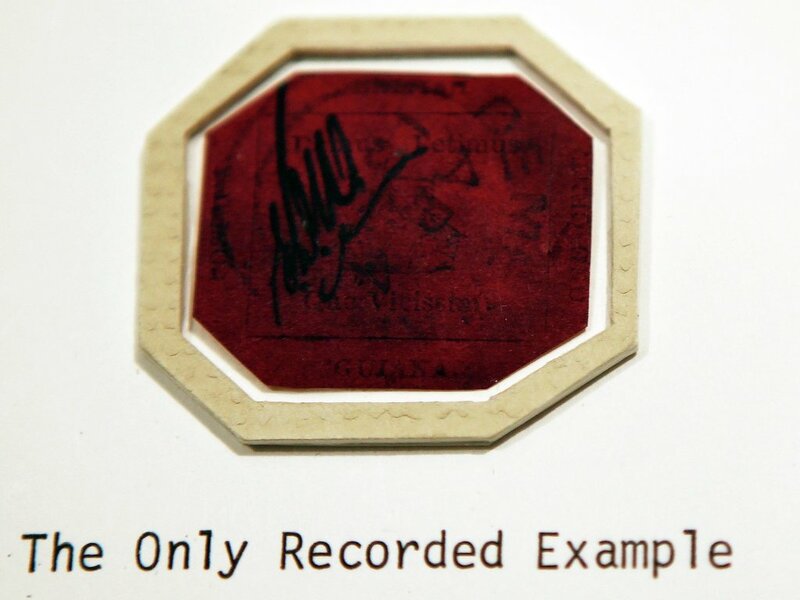 The pre-sale estimate is $10 million to $20 million, either of which would blow away the previous record for a single stamp set by the Swedish Treskilling Yellow when it sold in Zurich for $2.3 million in 1996. Printed in black ink on magenta colored paper, this simple stamp was an emergency issue. British Guiana, on the northern coast of South America, had been a British colony since the Napoleonic Wars. Originally three separate colonies — Essequibo, Demerara and Berbice — it was united as a single colony in 1833. It was almost 20 years before British Guiana began to receive regular shipments of English postage stamps manufactured by Waterlow & Sons. When one of those shipments was unavoidably delayed in 1856, postmaster E.T.E. Dalton commissioned the printers of the Royal Gazette newspaper in Georgetown to run off a contingency supply of stamps: one-cent magentas, four-cent magentas and four-cent blues. The one-cent magenta is an octagonal stamp one by 1.25 inches in dimension. It is printed with the image of a three-masted ship in the middle with the colony’s Latin motto “Damus Petimus Que Vicissim” (We give and expect in return) above and below the ship. Postmaster Dalton was apparently unimpressed with the issue, believing them susceptible to forgery. To thwart any attempts to forge the stamps, Dalton had post office workers initial every stamp. The one-cent magenta going up for auction was initialed E.D.W. by the postal clerk E.D. Wight. Very few of the small emergency run of stamps from a remote colony survived. There are a few examples of the four-cent stamps left, but only one of the one-cent. This sole survivor was rescued for history by a 12-year-old boy. L. Vernon Vaughan, son of a Scottish family living in British Guiana, discovered the stamp in 1873 amidst a group of family papers. He was an amateur stamp collector already, and although he didn’t recognize the stamp’s rarity, he did recognize that it was a stamp he didn’t have in his collection yet. He cut the stamp out and put in his album. Shortly thereafter, Vaughan sold the stamp to another local collector, Neil McKinnon, for a few shillings. In 1878, McKinnon sent the stamp to Glasgow, Scotland for inspection by experts. From there he sold it to a Liverpool dealer Thomas Ridpath who recognized what a rare and precious piece it was. 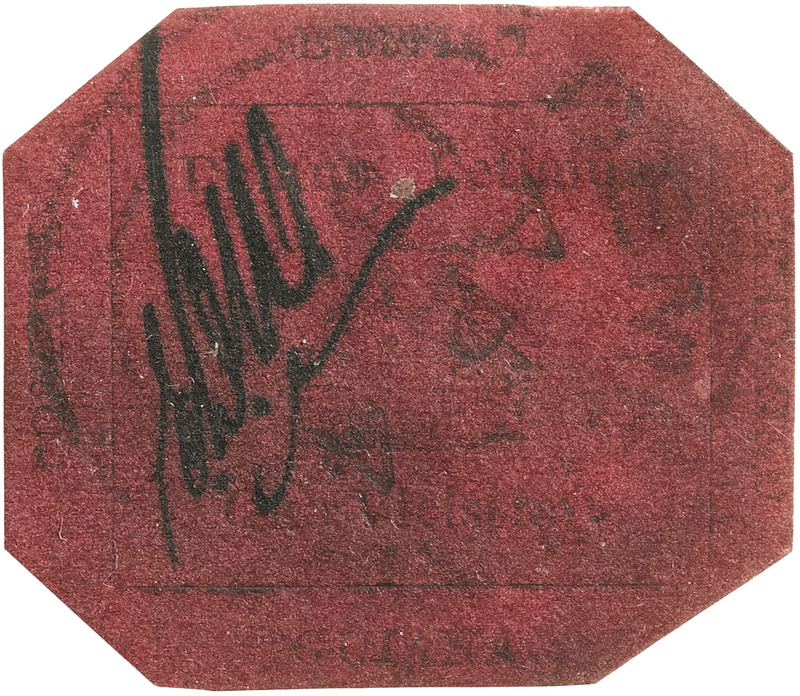 Ridpath sold it for £150 to Count Philippe la Renotière von Ferrary, a stamp collector of near legendary status who at one point owned both the One-Cent Magenta and the Treskilling Yellow. Ferrary’s left his vast philatelic collection to the Postmuseum in Berlin after his death in 1917. After World War I ended, the collection was seized by France as part of German war reparations and sold off piecemeal, very much against Ferrary’s wishes (he had wanted his magnificent collection to stay together forever and even willed the museum an endowment to care for the stamps in perpetuity). 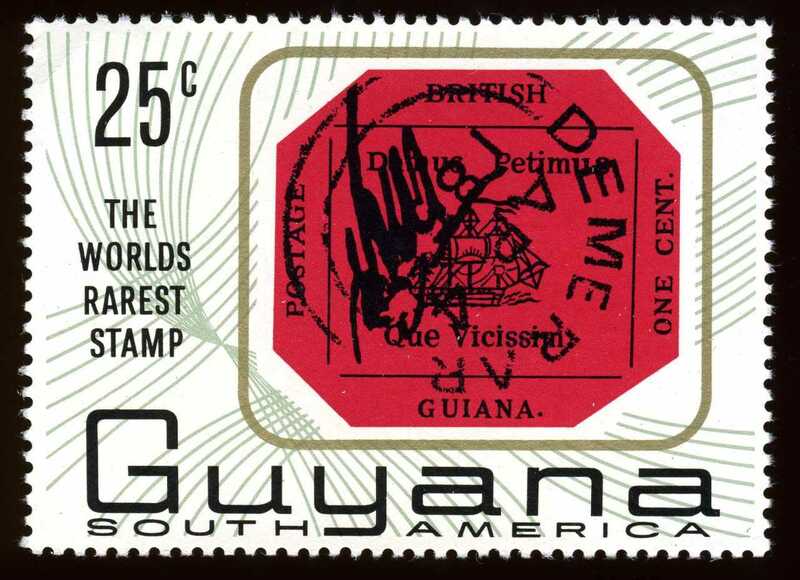 The British Guiana One-Cent Magenta was sold at auction in 1922 to textile magnate Arthur Hind for a then world record price of $35,000. That set the course for every other auction of the One-Cent Magenta. The next time it came up for auction was 1970, when it sold to a consortium for a record $280,000. Ten years later it sold at auction for yet another record: $935,000. The buyer was John du Pont, ornithologist, naturalist, amateur sports enthusiast, heir to the du Pont chemical fortune and an avid stamp collector. The last time it was on public display was 1986, when du Pont allowed it to be exhibited at the Ameripex ’86 International Stamp Show in Chicago. Ten years after that, John du Pont shot his friend, 1984 Olympics champion wrestler Dave Schultz, and killed him. He was found “guilty but mentally ill” of third degree murder. He was sentenced to 13 to 30 years at a minimum security prison in Pennsylvania. In 2010, he died still incarcerated. It’s his estate that is now selling the stamp. The British Guiana One-Cent Magenta will be traveling to London and Hong Kong this spring, its first public exhibition in 28 years. Then it will return to New York for its special night in June.